A little girl rides her scooter on Miaouli Square in front of Ermoupoli's grand Town Hall. As the capital of the Cyclades, the town of Ermoupoli has plenty of life all year round making it a great destination for an off-season island trip. Before the boat reaches the port of Ermoupoli on Syros, you will be able to make out the lonely church of Aghios Dimitrios, looking out like a sentinel over the wind-tossed sea. On spotting the church, the boat will sound its horn three times and then the church will ‘respond’ by ringing its bells. Local legend has it that this call and response started in honor of a shipwrecked sailor who avoided drowning by following the sound of the church bell to shore. I myself prefer to think of Saint Dimitrios as a good old fashioned host who hurries out to greet his guests, allowing the ladies of the house introduce themselves when the ship comes into the port: the medieval Ano Syros on the left, and the neoclassical Ermoupoli on the right; two grande dames inviting you into their homes. And while the fall sees other Cycladic islands becoming shy and retiring, these two ladies don their finest and put out tea and cakes, ready for a long chat. Two days are really not enough to cover everything, but even in 48 hours they will have a lot to tell you. The Church of Aghios Nikolaos in the district of Vaporia in Ermoupoli. 10.00 – The day in Ermoupoli seems to start in the enchanting Miaouli Square. Begin yours a little further down in the utterly charming Corner Cafe (3 Vikela, tel. +30 22813.01887), which specializes in nourishing snacks made from organic ingredients. We tried the very tasty potato pie with onion, cardamom and poppyseed as well as the vegan wild greens pie with fennel and black sesame. Both are creations of Alisia from Krakow, who lives on the island all year round and works in the café. 12.00 – Resist the temptation to get lost in the surrounding alleyways and neighborhoods and hop into a taxi. The medieval settlement of Ano Syros (or Apano Chora – meaning upper village) predates Ermoupoli, and as the elder, it gets priority. Specifically, it was founded when Greece was predominantly under Frankish and Venetian rule (1207-1537), and Syros was among the many Cycladic islands that were ruled by the Venetian Duchy of Naxos. As such, the majority of the islanders had accepted catholicism although Greek remained the predominant language. 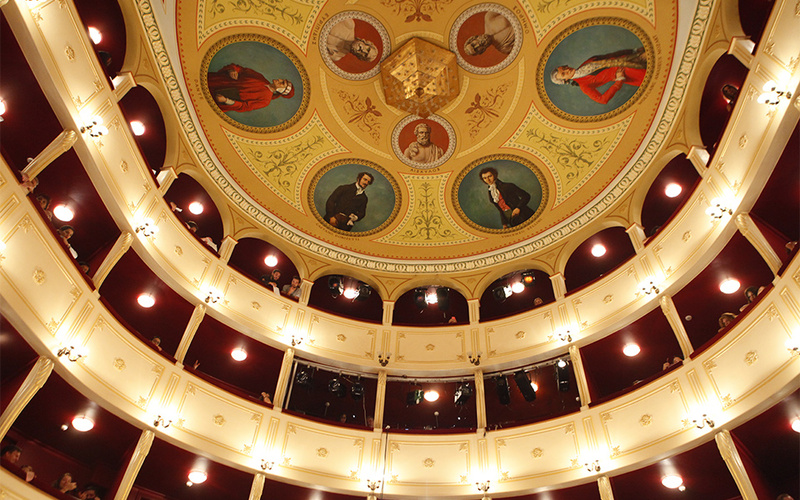 The impressive ceiling of the Apollo Theater in Ermoupoli. 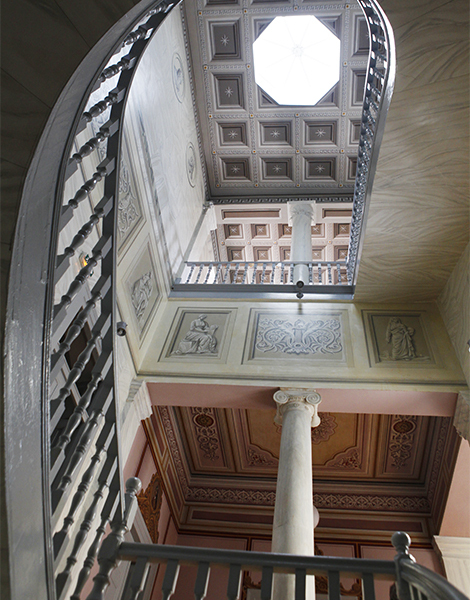 The interior of the Velissaropoulos mansion, one of the many grand neoclassical homes in Ermoupoli. 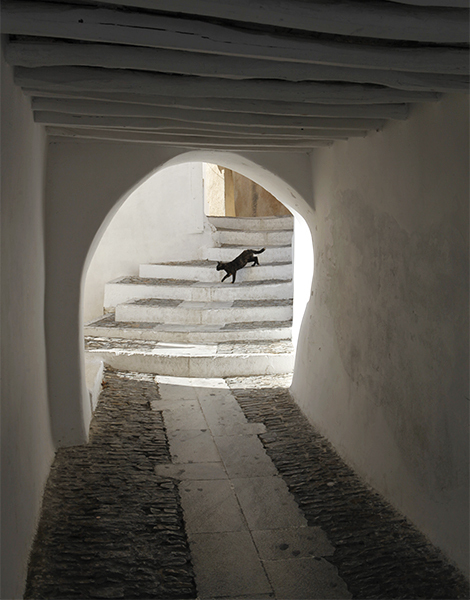 A covered alley and prowling cat in Ano Syros. Ask your driver to drop you off at Pano Terma so that you may explore Ano Syros heading downhill. A key landmark in the village is the catholic cathedral of Aghios Georgios (St. George), built in 1834. Its interior draws the most interest, and in particular the icon of the saint, which depicts him standing next to his horse having just slain the dragon, as well as the icon of the Virgin Mary Mother of Hope (Panaghia Elpidas), which is greatly revered by the island’s catholics. 13.00 As you make your way down towards the “piatsa” – the main road in the heart of the village where most of its shops are located (and which heaves with tourists during the summer) – you will pass by small, architecturally interesting homes, each one crammed up against the other. This, of course, was the rule in such medieval fortified villages where residents sought to conserve space as they huddled inside the city walls to protect themselves from attackers. You will take countless photos in front of wonderful entrances, covered alleys, bougainvillea-fringed balconies, little corners seemingly out of a film, small churches and scattered charming tavernas (most of which, however, are shut at this time of year). 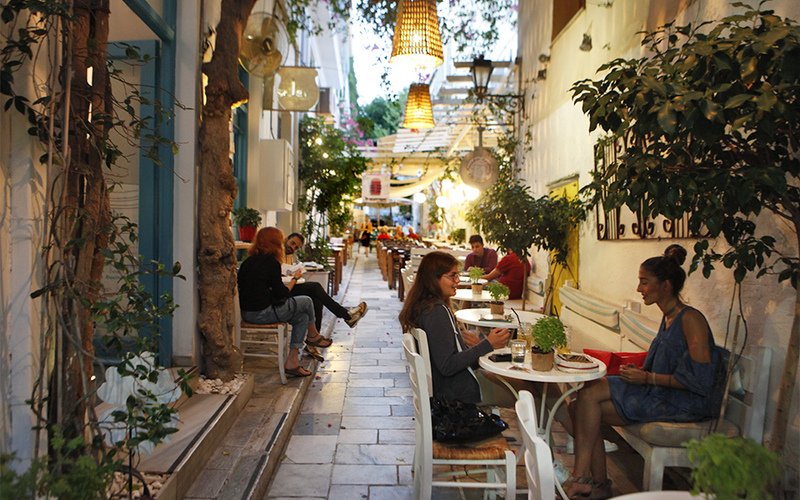 Roidis street in Ermoupoli is the main local hang out during the winter. On the piatsa, at the Markos Vamvakaris Museum, (tel. +30 22813.61065, Tues.-Sat. 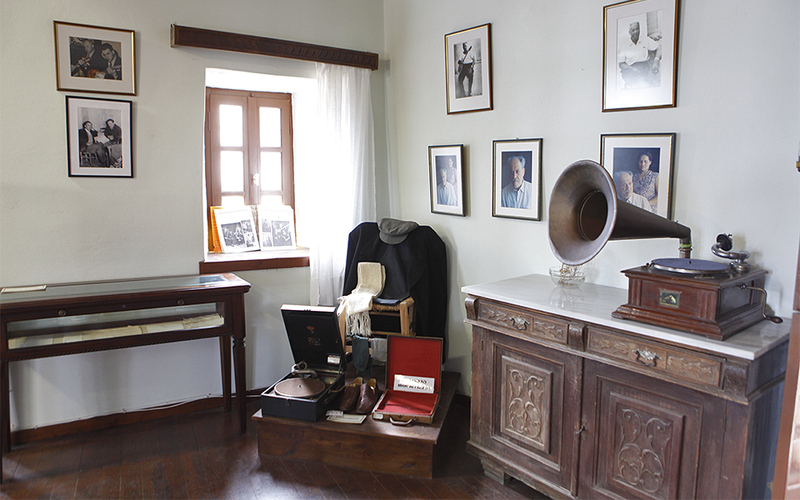 12.00-20.00) you will find personal items once belonging to the famed rebetiko musician who hailed from Ano Syros (including hand-written compositions, his watch, his wedding ring, and his good pair of cufflinks). At the Museum of Traditional Professions (located on a small street just off the main piatsa, tel. +30 22813.61065, Tues.-Sat. 21.00-20.00) you will see examples of traditional household implements and craftsmen’s tools from the island, as well as items linked to vanishing professions such as basket weaving and traditional yoghurt making. Also interesting is the ‘psifodohi‘ – effectively an old polling box where instead of paper ballots, beans or marbles were cast in its openings as votes. 14.00 – Stop for a bite at the only establishment open at this time, Maison de Meze (tel. +30 693.015.7193). 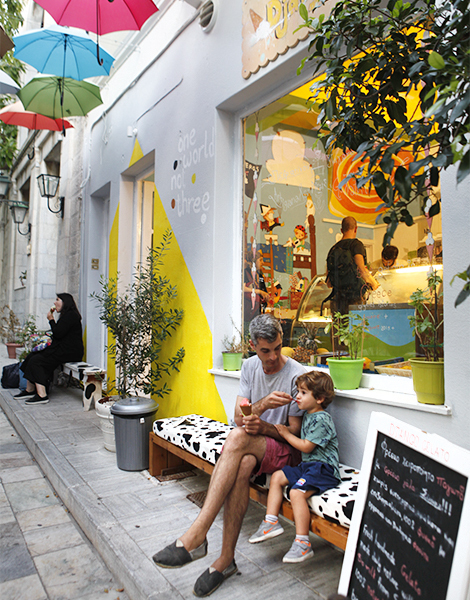 This exemplary café / delicatessen, as tasteful as anything you’ll find in Ano Syros, was created by two young entrepreneurs, Iasonas and Eleni. While not originally from Syros, they fell in love with the island and decided to move here for good. At their establishment you can buy traditional products that are made with care, either in house or by other small-scale producers. You can sample these in the pretty courtyard, or at the specially created bar indoors. Try wild capers and rock samphire gathered by Iasonas himself, jams and chutneys (made by Eleni) and much more. One of Syros' 'cat cafes' with two patrons. 16.00 After getting back to Ermoupoli (Taxi Syros Ermis, +30 22810.84222) it is time to take in the Vaporia neighborhood, the town’s grandest district which starts from Aghios Nikolaos church. When the founders of Ermoupoli first started arriving on the island following the Greek Revolution of 1821, (mainly refugees from the coast of Asia Minor and islands such as Chios and Psara), the wealthier among them began building homes in this area. Today you can admire some of their grand mansions – impressive examples of neoclassical architecture – and as you do so you will have some… unexpected company. 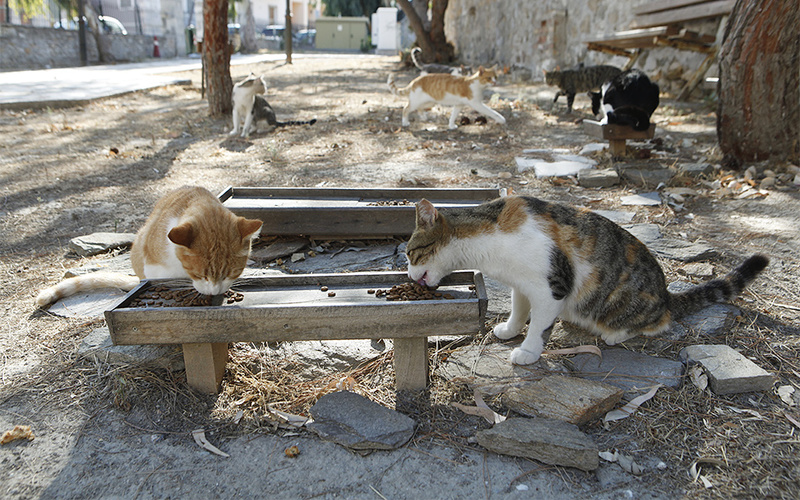 The so called “cat cafés” or “cat gardens” are tidy areas for feeding Ermoupoli’s roaming cats, outfitted with wooden feeding trays. They are the result of an initiative by local vet Manolis Vorrisis who, two-and-a-half years ago, decided to improve the lot of the stray cat population, spaying and neutering cats and providing them with better living conditions by educating local citizens and creating the cat cafés. 20.00 After a day with a lot of walking, enjoy a well-deserved, high-quality dinner cooked with flair and ambition at Avant Garden (Vardaka Square, tel. +30 22810.79416). 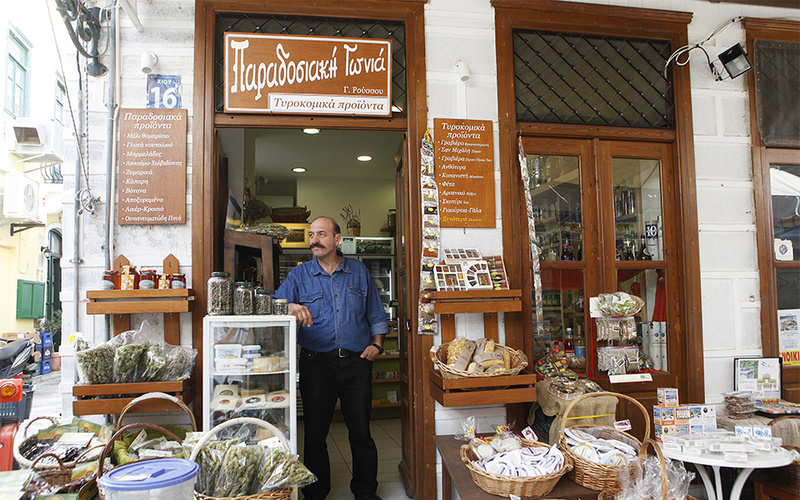 Traditional local products such as xinotyri (meaning ‘tart cheese’), louza (a cured pork) and sausage with fennel meet international ingredients such as peanut butter, coconut milk and hummus in the creative dishes prepared by the restaurant’s owner and chef, Konstantinos Bourantas. If you travel to Syros this time of year, make sure to do so over a weekend so that you can visit the shops and restaurants that close during the week. Additionally take comfortable walking shoes. Both Ermoupoli and Ano Syros are built on hills and getting around requires a lot of walking. A newly built boat is prepared to be launched at the Tarsanas boatyard. 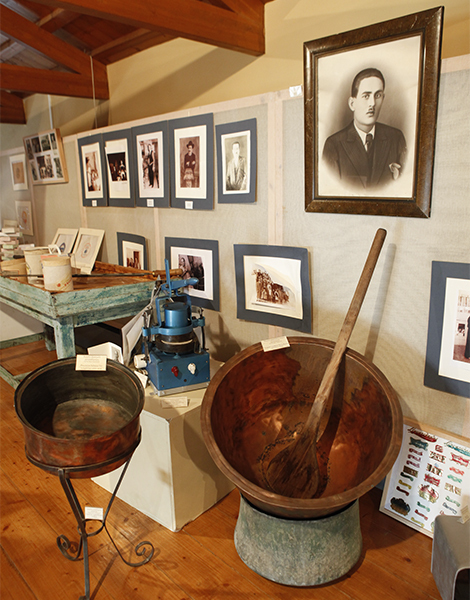 Exhibits at the Industrial Museum of Ermoupoli. 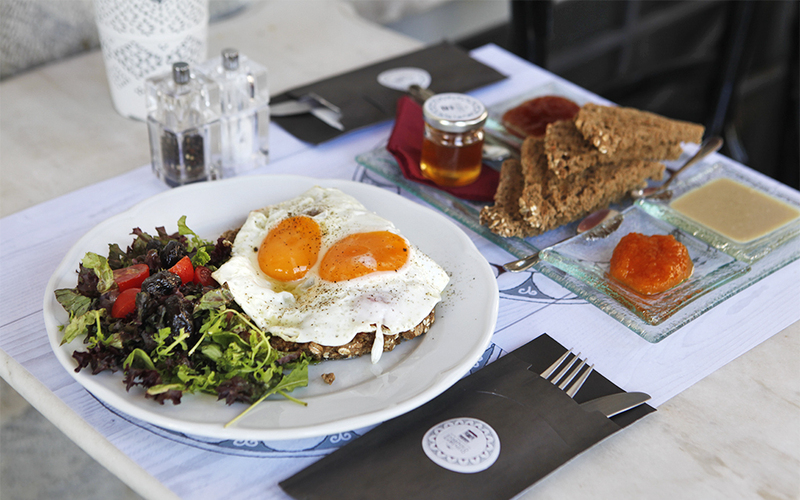 10.00 – Have breakfast in a setting with an elegant, vintage feel at the Elliniko Kafeneio on Miaouli Square. 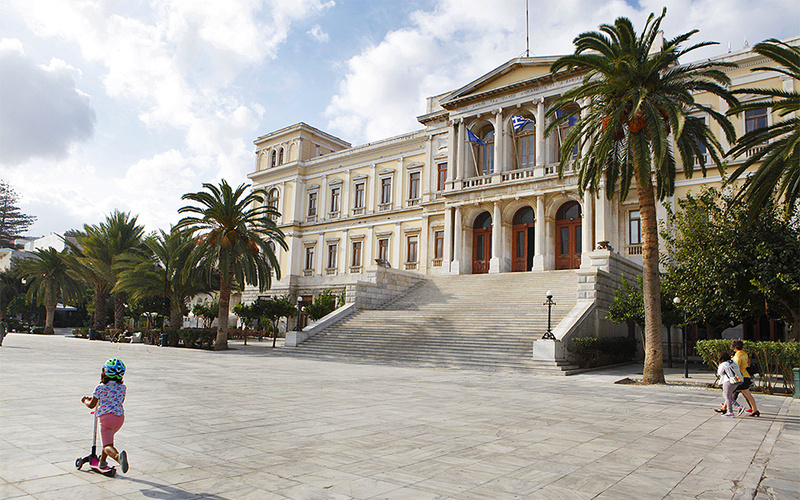 The marble-built 19th century neoclassical building in which it is housed is older than even the iconic town hall. If its not too cold, sit outside under the building’s wonderful archways. Try the Smyrna-style coffee (a blend of 7 varieties) and the breakfast with two different types of homemade jam, tahini, and thyme honey from the island on toasted multigrain bread, served with Greek mountain tea (ironwort) in a tea set as elegant as any you might find in a grand British home. 11.00 – Devote your day to the industrial area to the west of the town which in the 19th century was the beating heart of Syros’ economy. Neorio (Neorio 1) is an emblem of the area and Syros’ largest industrial unit with a tradition of boat building and repair that goes back to 1861. However it is temporarily closed while its fate is being decided. Tarsanas (located on Iroon Polytechniou), on the other hand continues to build and renovate wooden boats using traditional methods. A visit to the very-well-put-together Industrial Museum of Ermoupoli (11 G. Papandreou, tel. +30 22810.84762, Mon., Tues., Thur., Fri. 09.00-17.00, Sun. 09.00-14.00) will help you understand the important role the town once played as an industrial center, and why the port, until about 1860, was Greece’s biggest commercial port. Tours are given by the museum director himself, Achilleas Dimitropoulos, who talks about the exhibits with infectious enthusiasm. We were particularly impressed by architect Ernst Schiller’s original designs for the town hall, a recreation of a late 19th century clothing and fabric shop, and the first electric car in Greece that was built in Neorio in the 1970s on behalf of the English company, Enfield. A charming corner in Ano Syros. 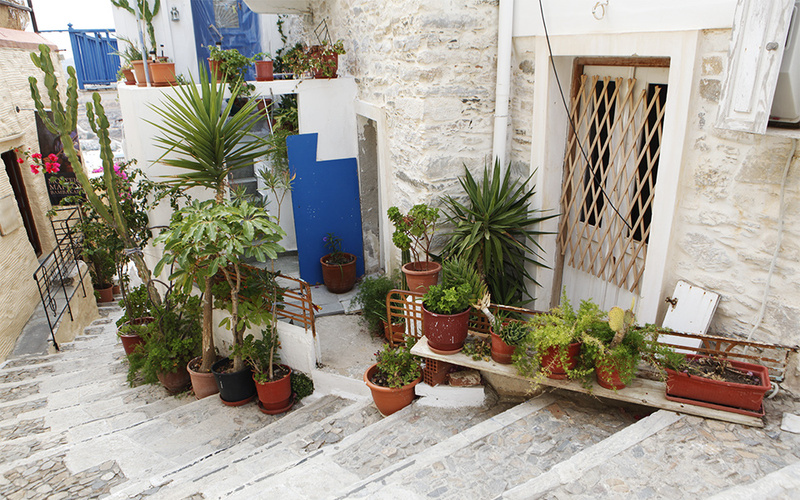 A plant-lined street in Ano Syros. 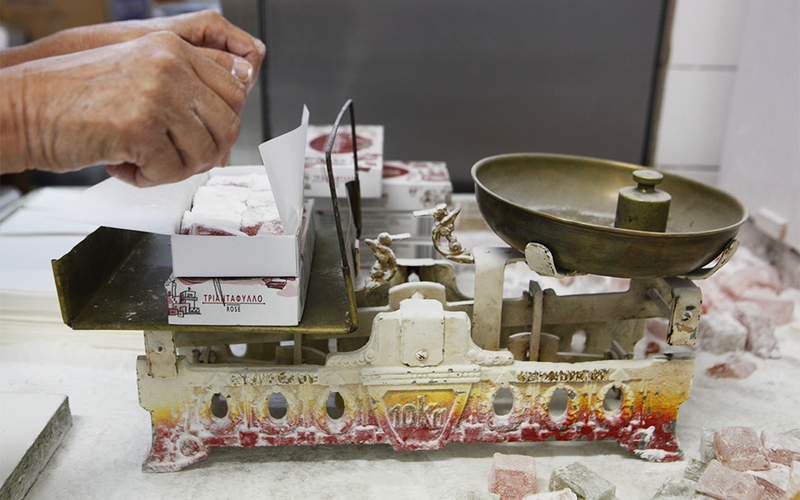 The island's loukoums that were once shipped to the finest homes around Europe are still made in the traditional way on Syros. 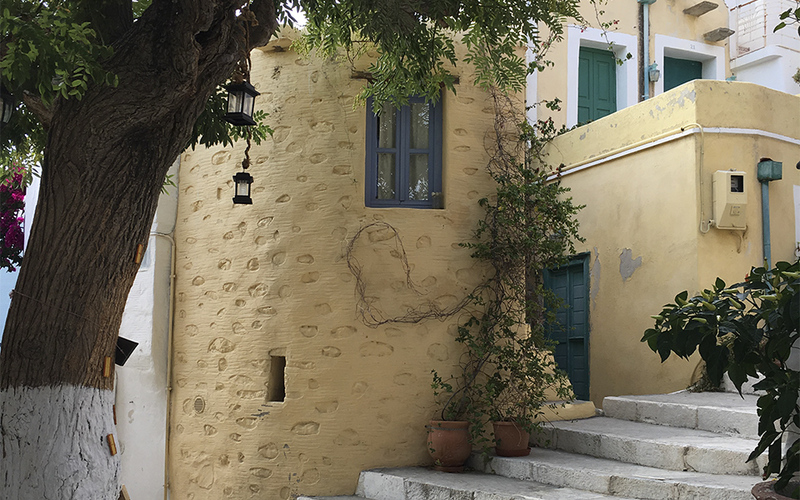 14.00 Head back to the center of Ermoupoli, along the alleys of the neighborhood of Psariana, one of the oldest in the city, which is located to the north of the commercial street of Stamataiou Proiou, The district is rather labyrinthine but it is well worth a visit. This is where a seafaring population lived – refugees of all social classes (ship owners, captains, sailors, etc.) chiefly from the island of Psara who fled to Syros following the 1824 massacre. As such, here you will see both simple homes as well as typical 19th century neoclassical mansions. 15.00 For lunch, Peri Tinos (Akti Petrou Ralli, tel. +30 22810.85000) is a good option for Cycladic and Greek dishes prepared with care. Try, among others, the twisted fennel pie and the skordomakaronada (garlic pasta) accompanied by Fabrika white wine. This is produced at the Syros Winery (Lagkada, Talanta, tel. +30 22810.61617), the only one on the island, and one which produces wine with a wonderful fragrance of thyme honey – imparted by both the grape variety as well as the thyme growing wild around the vineyards. 17.00 If you can still move after lunch, head uphill towards Vrontado, a working class neighborhood with countless steps to the west of Vaporia, and which was settled predominantly by refugees from Chios. A somewhat tiring walk up Ieros Lochos Street will take you to the highest point of Ermoupoli and the orthodox church of Anastaseos (the Resurrection), built in 1909. From its elevated location, it has been in ‘dialogue’ with the church of St George on the opposite hill for over a century. At the local shops you will find all manner of quality goods from the island. 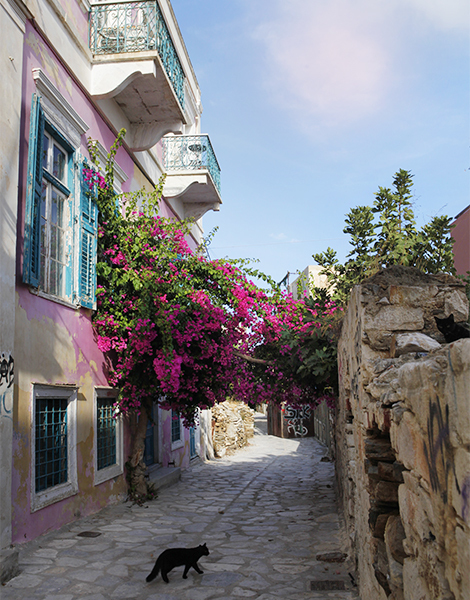 Despite the ravages of time, this alley in front of a neoclassical home near Miaouli Square continues to enchant. Stop for freshly-made ice cream at Django Gelato. 19.00 Returning to the town’s center, stop for an authentic ice cream made with local fresh milk and without preservatives at Django Gelato (10 Roidis, tel. +30 694.676.4896). The young owner and ice cream maker, Konstantinos Karakatsanis recommends the Aegina pistachio flavor, the sorbets made with organic seasonal fruits and the crema catalana, the last made according to a recipe taught to him by a Catalan visitor. 21.00 Enjoy a farewell drink at Kouchico (Roidis and Souris, tel. 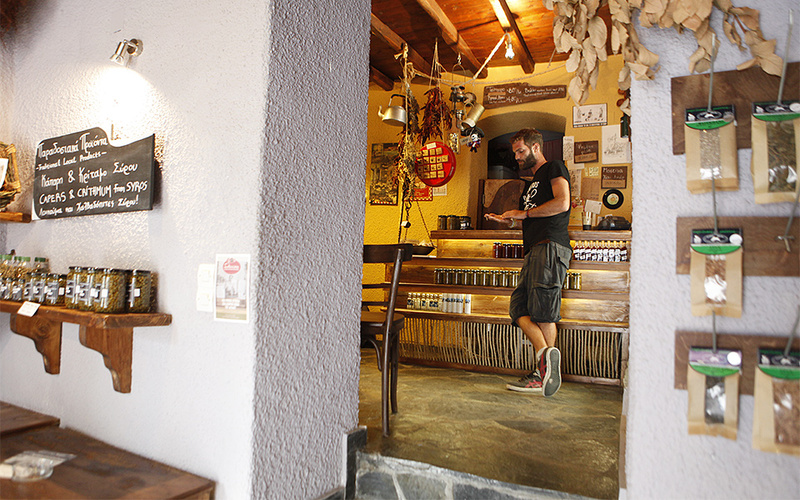 +30 22813.00880), which was opened by Christos Gkolfis in a postage stamp of a space initially as a café (we didn’t try any but the locals tell us that his coffee blends are splendid). Today it has expanded and is considered one of the best café-bars in town, with unusual offerings and signature cocktails. We flirted with the idea of a Spice Colada, but ultimately opted for the rum-based and subtly spicy Matteo’s (Matthew’s) Path. Its name has nothing to do with the Apostle Matthew, but it tasted truly divine. By sea from Piraeus with Blue Star Ferries (daily, 31.50 euros for a single) or with Hellenic Seaways (Monday, Tuesday and Friday, 30 euros for a single). Boutique Hotel Ploes, 2 Apollonos, tel. +30 22810.79360. Tasteful, luxury rooms in the heart of Ermoupoli. From 160 euros. Arhontiko Ermoupolis, 15 Vafeiadaki, tel. +30 22810.87711. Authentic, elegant and warm, housed in a listed 19th century mansion in the Vaporia district. From 70 euros. Hotel Aktaion, Akti Petrou Ralli, tel. +30 22810.81701. Elegant rooms in an 1843 stone-built neoclassical mansion by the sea. From 60 euros. Town Hall (Miaouli Square): Constructed in 1889 and designed by Ernst Schiller, the town hall resembles a palace rather than a municipal building. It is worth visiting if only for its open ground floor with its 16 columns and tiled floor. Aghios Nikolaos Church (Aghiou Nikolaou, before the Vaporia district). 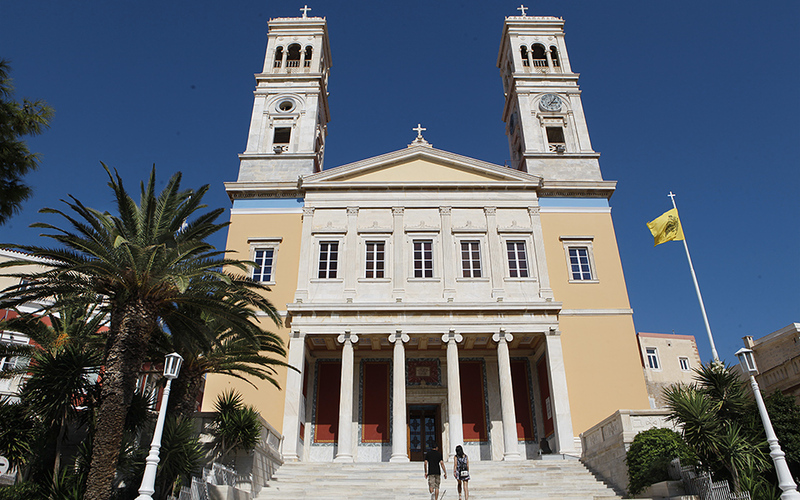 The metropolitan church of the capital of the Cyclades with its characteristic blue dome was completed in 1870. Without a doubt it is the most beautiful church in Ermoupoli with internal decorations that one can spend hours admiring. The Apollo Municipal Theater (Vardaka Square): Built according to a design by the Italian architect Pietro Sambo that drew on at least four Italian theaters including Milan’s La Scala, it was inaugurated in 1864 with a performance of Verdi’s Rigoletto. The fresco on the ceiling is the most beautiful work of art you will see in town. Mpampagiotou Street (Vaporia District): A row of neoclassical buildings looking out to the sea. Some operate as hotels and can be toured. Velissaropoulos Mansion (8 Aghiou Nikolaou): This grand neoclassical building dates to 1871 and houses the headquarters Cyclades Workers’ Union. Walk up to the first floor to see some of the best ceiling frescos on the island.